The ingredients for a great science adventure were all there in the fall of 2016 for three high school sophomores from Commack High School in Long Island, New York. Curiosity and desire—combined with support from a NASA organization, dedicated mentors, and their school district—along with access to mapping and analytics in the ArcGIS platform helped Karen Abruzzo, Delina Levine, and Pragati Muthukumar begin their space research journey. 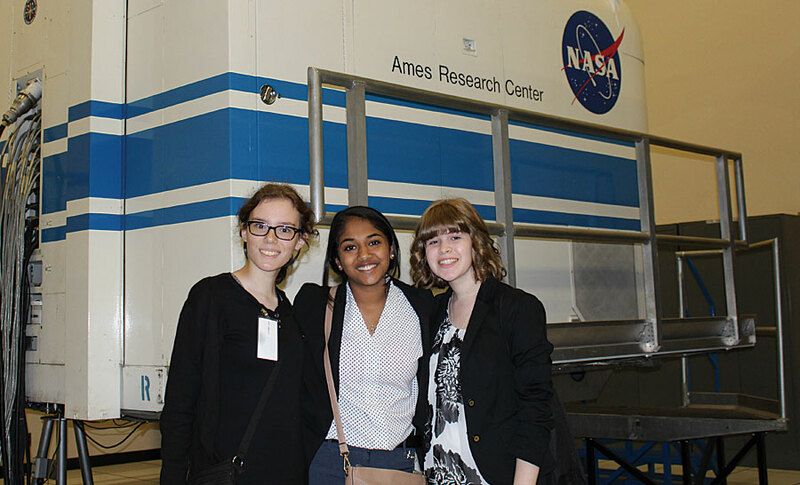 Members of the winning Commack High School research team shown in front of the Vertical Motion Simulator during their tour of NASA Ames Research Center (from left to right: Karen Abruzzo, Pragati Muthukumar, and Delina Levine). Richard Kurtz, their teacher, introduced them to ExMASS (Exploration of the Moon and Asteroids by Secondary Students). This contest, sponsored by the Lunar and Planetary Institute (LPI), allowed the students to cultivate and combine their interests in GIS and astronomy, especially as related to the moon and asteroids. All three students have had a lifelong passion for space, so they immediately signed up to begin a project. In this rigorous competition, student teams from 10 high schools from around the United States develop research projects that involve the moon and asteroids. The competition begins with six weeks of preliminary work related to basic lunar and asteroid science, followed by student presentations about initial findings to Andrew Shaner, the ExMASS organizer. ExMASS arranged for the teams to be assisted by mentors, typically from research institutes. The teams spend six months working on group-developed and group-driven research projects. At the end of this period, each team creates a research poster that is evaluated by experts in the field. The four teams with the highest-scoring posters were given the opportunity to present to expert judges via video conference. The team with the best presentation was awarded the opportunity to attend a conference at NASA Ames Research Center in California. 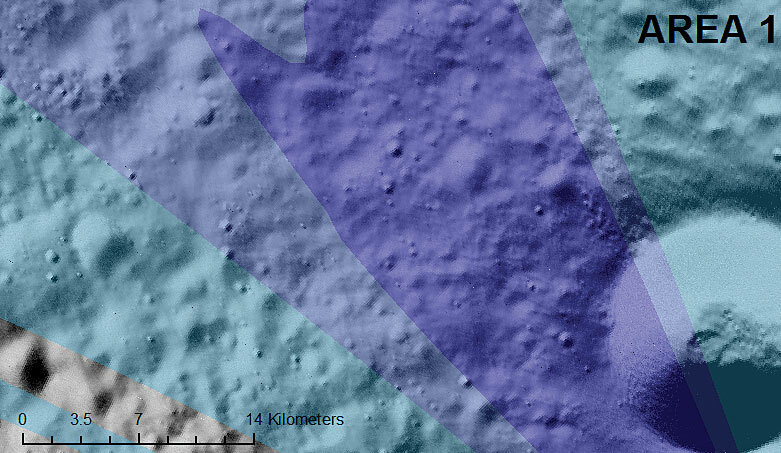 This is a map of Area 1 at the lunar South Pole produced using ArcGIS showing hydrogen abundance, oxygen abundance, hillshade, and slope layers. The Commack High School research team developed a project that applied the use of ArcGIS to map possible locations of lunar ice mining using topographic, elemental, and economic data with assistance from their dedicated mentors, Dr. Tabb C. Prissel of the Department of Earth and Planetary Sciences at Rutgers University and Dr. Jennifer Whitten from the Center for Earth and Planetary Studies at the Smithsonian National Air and Space Museum. The students used GIS to layer this data so that the finished map would show the lunar topography, slope values, and elemental abundance of both hydrogen and oxygen in an area. They also considered economic feasibility, as they needed to ensure that lunar ice mining would be practical. The students made two assumptions. The first assumption was that the areas where the highest concentrations of hydrogen and oxygen overlapped would be more likely to contain water ice. The second assumption was that areas with the lowest slope value and the highest abundance of each element would be the most economically feasible to mine, making those areas attractive potential mining locations. The students worked with public domain data: topography data from the Lunar Orbiter Laser Altimeter (LOLA) and elemental data from the Lunar Prospector (LP). 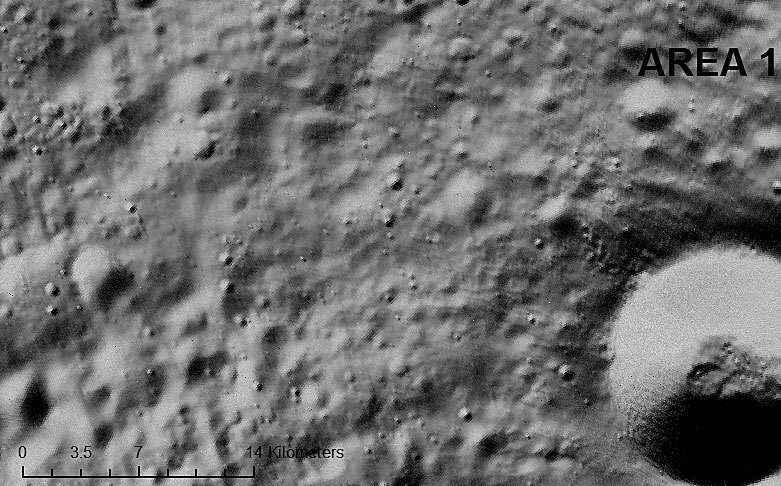 The students began with a basemap of LOLA topography data to which they added a hillshade layer that filled in gaps in the original LOLA data and provided a grayscale 3D representation of the surface that improved the lunar surface image resolution. 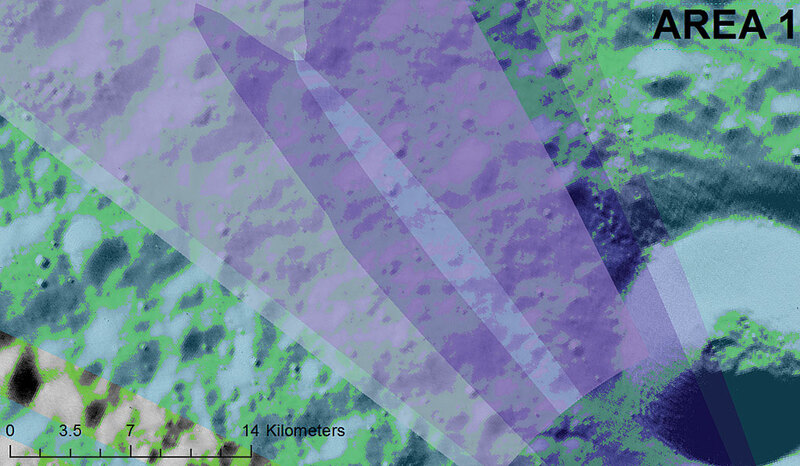 The students then added a slope layer and highlighted areas with a slope of less than 6 degrees. 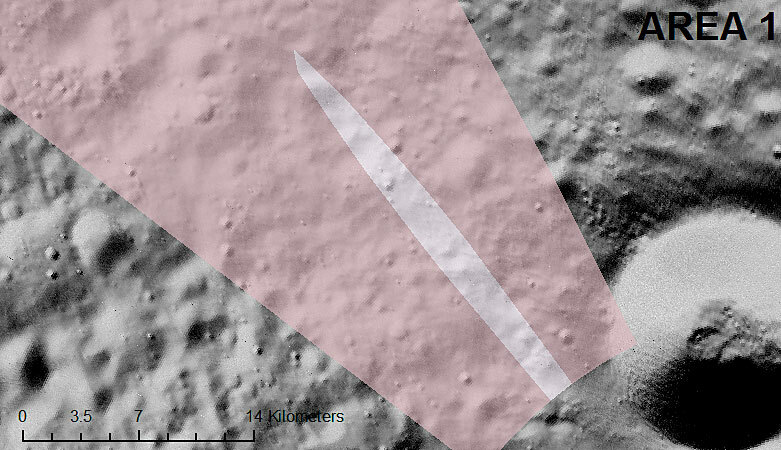 These areas would be level enough for a spacecraft to land on and remain stable. The next step was to import the LP coordinate elemental data and highlight areas of highest oxygen and hydrogen abundance to locate potential mining sites. The students researched rockets built by the United States, including those of upcoming SpaceX projects, to evaluate the cost of fuel, payload capacity, and the cost of the entire mission. They compared various rockets to determine which would be the best for a lunar mining mission and determined a spacecraft with low fuel cost, high payload, and low cost per mission would be the best candidate for a lunar mining mission. ArcGIS image of the lunar North Pole, with all data layers shown. High levels of oxygen (pink and white) and hydrogen (blue and purple) can be seen in various areas at the North Pole. Although this type of research may seem a bit farfetched, the students noted that the implications are quite promising for the future. If water ice were to be mined and then decomposed into liquid oxygen and liquid hydrogen, two important components of rocket fuel could be obtained. Creating a launch point on the moon is under serious consideration in the space industry, so having a fuel source on the moon would lower both fuel and energy costs. Also, scientists are seriously considering a potential lunar base, and water ice could be used as a coolant or converted into breathable oxygen. 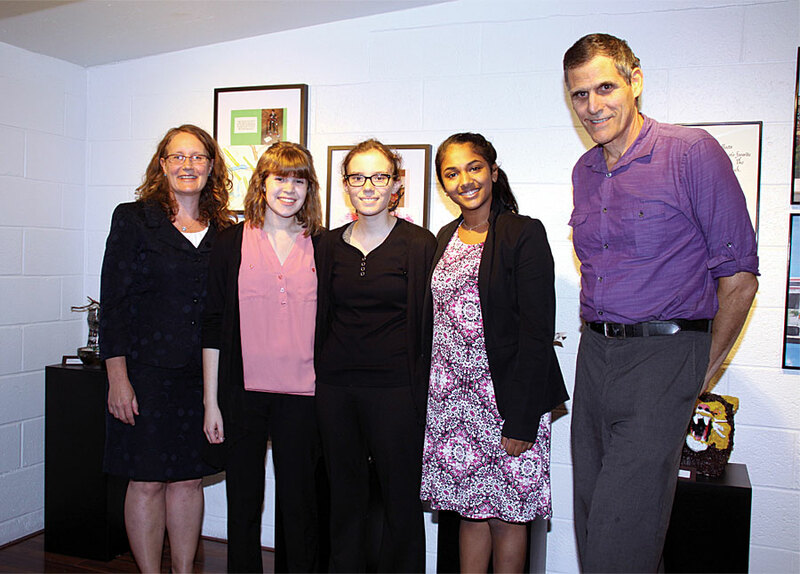 The team’s project was awarded first place in recognition of the authors’ research efforts and results. 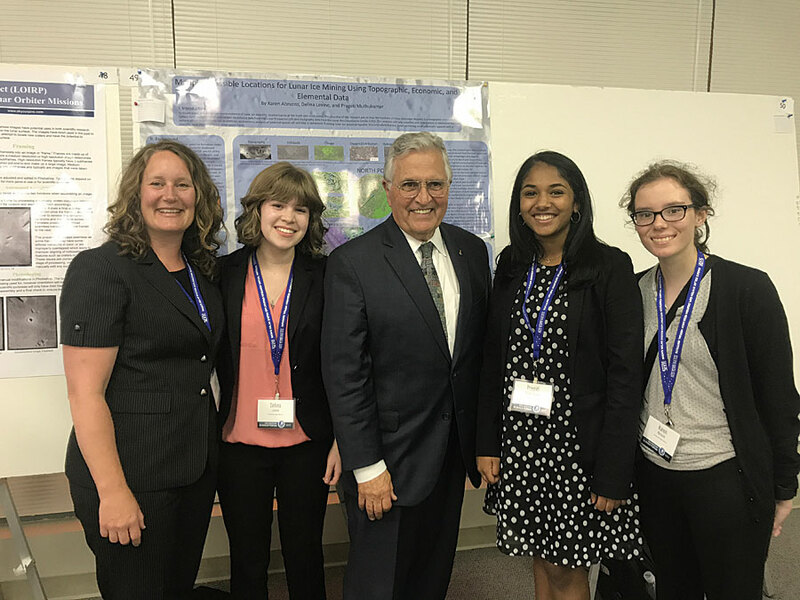 To reward this achievement, the students attended the NASA Exploration Science Forum held in July 2017 with Dr. Alison Offerman-Celentano, Commack’s director of science. The forum was hosted by the Solar System Exploration Research Virtual Institute (SSERVI). As the only high school students at the forum, they were excited for the opportunity to present their work to professionals in the field. During the forum, they were able to listen to engaging presentations and learn about the latest lunar and planetary research. The students found a panel discussing water on the moon to be one of the most interesting presentations. In their experience, the idea of researching water on the moon was usually regarded as farfetched. However, this panel confirmed that their research was not only relevant but a hot topic in the lunar and planetary field. They also participated in a student poster session in which they shared their research with other scientists. Through engaging in conversations with fellow researchers making connections, they glimpsed what their futures might be like as science researchers. Although the three students had fun doing the project, it was not without its challenges. 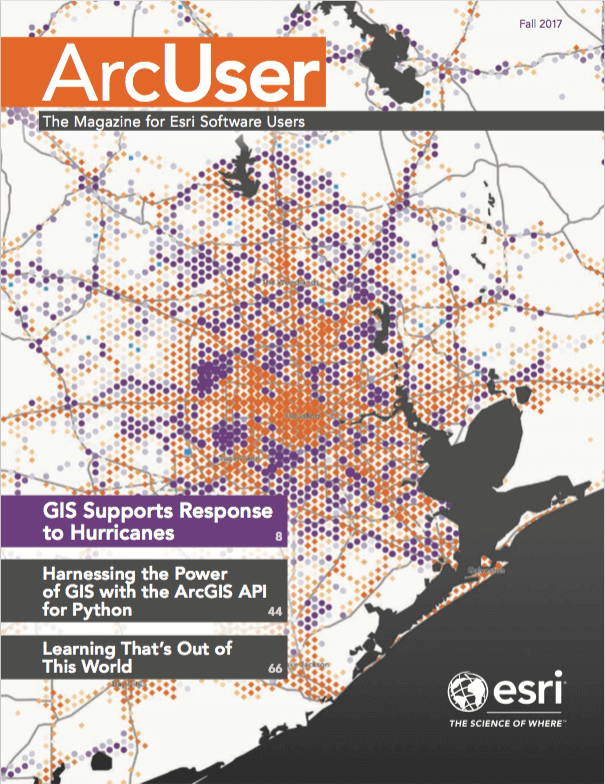 Through working tutorials on the Esri website and YouTube, they learned on their own how to use ArcGIS. Learning a complex program under a time constraint was definitely a test of their abilities. The limited time was also a challenge, as these high school researchers frequently found that there was simply too much they wanted to do and not enough time to get it done. However, they found the entire experience to be invaluable and certainly unforgettable. The project gave them the opportunity to experience research that was impactful outside of the classroom. They spent the vast majority of their spare time working on this research project. Even after numerous failures and setbacks, they were motivated and eager to see where the project would take them. This is a skill that will definitely benefit them in the future. These high school students realize that the opportunity to do real-world research, get advice from experts, and use the ArcGIS platform was unique. They can honestly say that they had a fantastic time researching lunar ice mining, and they have learned that you never know where your research will take you. For more information on using GIS for STEM, contact Kurtz at RKurtz@commack.k12.ny.us or 631-786-7426. The authors thank Tabb Prissel, Jennifer Whitten, Richard Kurtz, and Dr. Alison Offerman-Celentano for help and encouragement during this project. Karen Abruzzo, Delina Levine, and Pragati Muthukumar are now eleventh-grade students at Commack High School. They began conducting research in ninth grade and have loved it ever since. Abruzzo is interested in electrical engineering and computer science and wants to work in the field of astronomy as an engineer. She is a member of the Astronomical Society of Long Island and enjoys reading whenever she has time. Levine enjoys physics and hopes to be an astrophysicist in the future. In her free time, she loves studying music and is an excellent piano player. Muthukumar finds chemistry and biology extremely interesting in addition to space. She is also a music lover, and she sings and plays viola and piano. All three students are extremely grateful to have had this opportunity and are excited to see what the future holds.